North American Lighting (www.nal.com) has been manufacturing automotive lighting systems for vehicle manufactures since 1983. At the Paris facility, compressed air is generated in two compressor rooms with 5 compressors from various compressor manufacturers. To read the full case study published in Compressed Air Best Practices, click here. Airleader performed a complimentary leak study and leak repair. The service provider knew there were much greater energy savings to harvest through system improvements and persuaded a reluctant management to install a Master Controller to continuously monitor the system during operating hours and down time. By monitoring and analyzing key performance indicators with the Master Controller, improvements to increase the efficiency of the system were identified then verified. The project resulted in an overall decrease of 2,582,979 kWh annually or $215,037 at current rates. 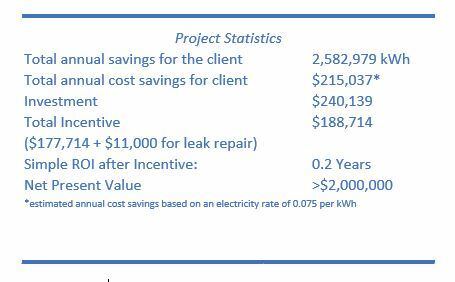 Additionally, the mill received a utility rebate in the amount of $177,714 which resulted in a simple Return on Investment of 0.2 years. No performance or cost information about the air compressor system was available. Multiple air compressors were running in load/unload, without proper control. This resulted in a lot of wasted energy. The team was looking for ways to improve the energy efficiency of their compressed air system and increase awareness of compressed air cost and usage. To evaluate the system efficiency, we performed an energy audit with the AIRLEADER Data Logger. The Airleader data logger is designed specifically for compressed air audits. It captures data on KW usage, flow information, system pressure load/unload cycles, compressor starts and much more for 7 days using one second readings. The KW usage can be based on 3 phase amp and 3 phase voltage probes. The evaluation software provides us with many data points, in particular the KW/100 CFM allows us to quickly evaluate the overall efficiency of the system based on CAGI Rating of the Compressors we can indicate efficiency improvement potentials. Energy savings amounted to 31.1 % from 25.8 KW/100 CFM to 17.88 KW/100 CFM, thereby reducing the energy use from 1,774,462 kWh to 1,150,354 kWh for a total savings of 624,108 kWh per year. Over the span of 10 years this amounts to a savings of 6,241 MWH. At an estimated energy cost of 10 cents/kWh this totals to savings of $624,108. Payback time for this particular installation was 6.9 months. CO2 savings of this project amounts to 842,545 pounds/year based on the 2000 electricity mix. This energy savings is the equivalent needed to run the electricity of 55 average US households based on 2005 EIA data. Canadian glass manufacturer Trulite manufactures high end commercial glass products. The production of laminate glass, which requires the use of an autoclave, is especially energy intensive. To reduce production times and fill times of the autoclave, the autoclave system is constantly pressurized by two 150 hp compresors. Lack of storage causing large pressure swings. No control of the compressors causing excessive idling. Grossly oversized plant VSD compressor on the lower pressure side of the system. An Airleader Master Controller was used to analyze the system and simulate the best options for configuration and operation of the two systems. Following changes, the system runs trouble free with online visualization of the entire system ensuring reliability and peace of mind. The energy reduction of the system is an astounding 83% decrease in kWh, or 2,343,400 kWh reduction. Additionally, at the completion of the project Trulite received a utility rebate for $147,428 CND. Alan Beatty, maintenance manager at Lacks Enterprises’ Paint East facility, said the Airleader met the company’s interest in conserving energy. “We have four air compressors, and we were looking at ways to save energy and utilize the compressors more efficiently,” Beatty told MiBiz. “The Airleader looks at air pressure and demand and selects the right compressor combination to most efficiently achieve the demand at that time.” Beatty said SIGA Green Technologies “came in and did an analysis and basically hit all of the objectives and estimates (they promised).” He added that since the Airleader was installed, he has seen substantial electricity savings at the 107,000-square-foot paint facility. “We know absolutely what that savings is. We went from 0.433 kilowattshours per 100 CF (26.0 KW/100CFM) to 0.298 kilowattshours per 100 CF (17.8 KW/100 CFM)” for air compressor operations, he said. “That’s a savings of 31.1 percent”.